There's no doubt that fruit smoothies are profitable menu items. Make sure to enhance your bar, coffee shop, or cafe's drink menu with a variety of flavorful smoothies, including a top-selling strawberry banana-flavored smoothie made from this Torani 64 oz. mix! This mix delivers a refreshing, full-bodied strawberry banana flavor and vivid color, while its large capacity means you'll be able to satisfy dozens of customers before needing a replacement. The 64 oz. container also features a large handle that makes pouring easy and a resealable cap that's great for keeping unused product fresh. Save time and costs from buying smoothie ingredients and lessen kitchen preparation time with this premade mix that's made with real fruit, no artificial colors, and no artificial flavors. Simply pour over ice and blend - it's that easy! This is our BEST / favorite flavor hands down!!! This is so flavorful!!! I will definitely e ordering more! The onlybregret I have is that we didn’t order more in the beginning!!! You MUST try this flavor it is glorious!!! This is a big hit in my coffee shop. It taste like a fresh fruit smoothie would. My customers love this item. I have even added protein powder in with this product. 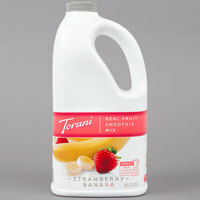 I have tried some of the other strawberry banana fruit smoothie brands and they were good but Torani to me was better. Great fruity flavor. Strawberry banana is one of our most popular flavors. It is easy to make and delicious! Great for everyone all year long. We love Torani smoothie mixes! I really love the strawberry banana fruit smoothie mixed with yougert. Its a great start for a morning drink or even as a midnight snack. Torani makes a very high quality Strawberry Banana Fruit Smoothie mix that we package with our Smoothie Concession Trailers that we manufacture and sell. Delicious!!!!!! A great smoothie mix and everyone's favorite flavor. The strawberry banana mix is great and so easy to prepare yummy smoothies in just a few seconds. You will want to try this brand and flavor. this flavor is one of our top sellers. I have tried others from different places but I still think this taste the best. I can see why it is a top seller. Absolutely delicious. This is one of our best sellers, it is hard to keep it in stock! We also have the Torani Raspberry mix, which is much sweeter. This one is well balanced with good flavor and mild sweetness. A strawberry banana frozen daiquiris is always delicious and the Torani mix helps us make them perfect each and every batch. A great price and great easy to our pour jug style. The Torani strawberry banana fruit smoothie mix is excellent. We have it every morning for breakfast and its very easy to make. The flavor is top notch as well. A top notch strawberry banana mix that is great for making milkshakes. The flavor is very strong and the mix incorporates really well. I can not wait to try another flavor. The Torani strawberry banana is one of our customers favorites. And from a coffee shop owner's stand point I love how easy it is to make. To me this has the best flavor of them all. Sometimes the banana flavor takes over but it's light enough that you can taste the strawberries. Will continue to buy this! A sweet and fruity smoothie mix that is bursting with the sweet taste of strawberry and fresh bananas. Simple to mix and taste wonderful. A crowd favorite at our smoothie stand. This was one of our popular sellers. But because of space we decided to only get the Strawberry and use a banana product we already had on hand for coffee. This made it so we didn’t have to store more 64oz jugs. Torani makes the best smoothie mix that we have found. Very easy to mix with the convenient add on pumps and the flavor is nice and fresh. This strawberry banana fruit smoothie mix is a customer favorite! It is easy to use, just simple add ice and blend and you have a perfect smoothie! This adds the flavor of strawberries and banana in a cost effective package. We use this product at our school events and the kids line up because of the flavor. This is a great brand. All of their products taste great but this strawberry banana one is a favorite. It tastes like real fruit. I just add yogurt and ice. A great and trusted brand of smoothie mix. Taste fresh and delicious and really great value. An easy to pour handle and screw on and off lid. A great tasting strawberry banana mix that balances both flavors for a great pairing. One of our customer's favorites!! Super easy to make. We have had a couple bottles damaged in shipments. But, as always, customer service did a great job refunding and reshipping our items. My customers love this flavor. Especially the younger ones. Aside from hot chocolate, strawberry banana smoothies are one of the most common flavors parents order their children and they love it. Torani has been a leading brand for some time in the syrup realm, however, this is our 6-7 smoothie mix that we have tried and its impressive. Not only does it taste original and authentic, but its extremely easy to use and handle. It comes well packaged with a resalable cap. torani 64 oz. Strawberry Banana Fruit Smoothie mix. This product is very good I definitely recommend for any body My customers love this Great product. Great drink. Especially on a hot day. Just add smoothie mix and ice to a blender, blend and done!! Can also be topped with whipped cream. This product is absolutely amazing. The flavor profile is mind blowing. My Strawberry Shortcake cupcakes are to die for. You will not be disappointed with this purchase. Strawberry banana is a common flavor combination and with good reason. They are two flavors which compliment each other well. They certainly do in this smoothie mix. This is absolutely delicious!! I love that you can use it as a base to make many different recipes with. If you are looking for a good smoothie mix, go with this one. I didn't used to be a big fan of Strawberry Banana smoothies. This one I really like! The mix is very thick, and can be diluted a little bit with water, milk, or tea. It helps it make more drinks. I also like to add Greek yogurt. It's made with real fruit, and is very flavorful and sweet. The color is beautiful and the thickness is perfect. I really liked this smoothie mix. Great for someone who doesnt want to make their own from scratch. It was really convenient... The strawberry/banana flavor was out of this world. Very thick and quite tasty. It took making a few smoothies before we got the ratio of ice and mix right, but once we got it, you can't tell the difference between it being a mix and real fruit smoothies. I did not like this at all. It has a very artificial taste to it. This product also costs twice as much as some other competitors. We appreciate your review, Gregory! If you are looking for a different product that will better suit your needs, please contact our Customer Solutions team. Probably the most refreshing smoothie mix torani offers. The banana flavor gives it a lightness that's really tasty in the summer on a hot day. This TORANI STRAWBERRY-BANANA IS OFF THE CHARTS! !WONDERFUL FULL OF FLAVOR. It makes the best smoothies and is worth every penny. Addicted to it .Thanks for a great product. Oh my, I have tried other smoothie mixes but this is the best ever. The flavor is excellent and gives you an enegy boost, also. This is a fan favorite. Customers love this product. It tastes great and for the cost you really can't do any better. I recommend buying in bulk. This is always a favorite! If you are using just a banana syrup with smoothies and smoothie strawberry mix, please stop. This product is way better!